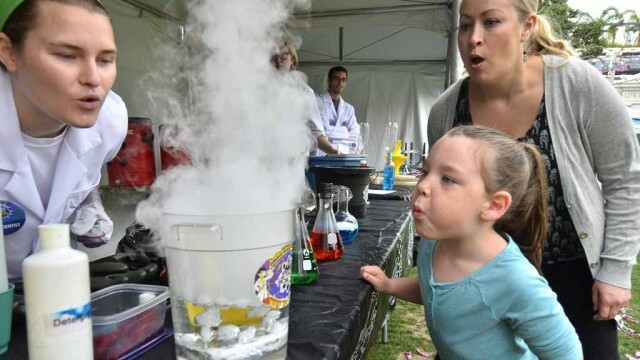 The San Diego Festival of Science & Engineering will open Saturday with the ninth annual Expo Day at Petco Park. More than 130 businesses and organizations will provide hands-on, interactive exhibits and activities for around 24,000 student scientists and their families who are expected to attend, according to the nonprofit Biocom Institute, which organized the free event. Illumina, the San Diego-based maker of genetics equipment, is the event sponsor. The day’s activities will include appearances between 2 p.m. and 4 p.m. by actors Naomi Scott, Ludi Lin and Dacre Montgomery, stars of the new “Power Rangers” movie that opens on March 24. The event will feature a mobile science lab called the “Curiosity Cube'” that was fashioned out of a shipping container. There will be TEDx talks from youngsters sharing their ideas, organized by the Cajon Valley Union School District. Experts from the League of Extraordinary Scientists will be present who can discuss nanotechnology, artificial intelligence, genomics and other disciplines. Various stage performances, including rappers from The Music Notes, will break down math concepts with rhythm and rhyme. Parking is available for five dollars at the Tailgate Lot and Padres Parkade. Families are welcome to bring a sack lunch, though kids meals are available for six dollars and include a hot dog, juice box and cookie. The overall festival will continue with events throughout the week. A calendar is available online at www.lovestemsd.org.